The benefits of fitness stretch far and wide, from weight loss and muscle gain through to improvements in mood and concentration. In order to help you harness some of these amazing advantages, we have created a series of corporate fitness programs and bootcamps. Here at Fighting Fit PT, we can help your corporate team to work together by giving them access to a shared experience based on fun and fitness. The corporate and fitness worlds have a lot in common, with our expert trainers helping to ignite the competitive spirit of your workplace and bring your team together. Here at Fighting Fit, we believe that fitness can help to change the world. While personal trainers are an important piece of this puzzle, many of the benefits of fitness are enhanced due to the group environment. We provide a range of corporate training sessions that help you to get the most out of your team. Our group training programs are based on high intensity interval training (HIIT), an innovative approach to fitness that combines periods of high intensity with periods of low intensity or rest. We also provide additional classes and exercise routines, including endurance training, weight training, tabata training, circuit training, pyramid training, boxing, and a range of bodyweight and core strength exercises. Whether you work in a stressful office environment or on a factory floor, group fitness classes provide a wealth of immediate and long-term benefits for your employees. Along with the obvious benefits of weight loss, improved strength, and enhanced flexibility, fitness classes also help people with motivation, concentration, socialisation, and mental health. Corporate fitness programs help to encourage staff loyalty, improve team building, and reduce absenteeism in the workplace. People enjoy working in a fun and exciting environment, with fitness training programs a great way to add a sense of novelty to the corporate environment and improve the work-life balance. The shared experience of training is also important because it helps your team to bond and work together. 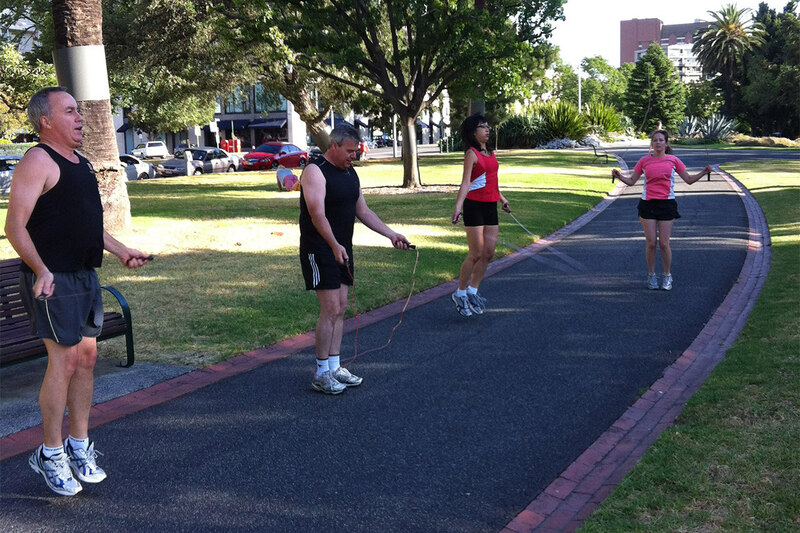 Along with regular group fitness classes for corporate clients, we also provide bootcamps in Melbourne for work and social groups. A bootcamp is an exciting way to get your team together and reap the benefits of active fitness in a fun and novel package. By pushing yourself to your limits and making memories together as a team, you can help to create a unified workplace based on a sense of trust and communication. Team building is an important attribute of any modern company, with bootcamps one of the best ways to improve corporate culture and add a sense of fun to the workplace. Here at Fighting Fit, we offer bootcamps for fitness at the best facilities in Melbourne and provide fitness programs at our corporate fitness centre in Preston. Do you want to discover more about bootcamps and corporate training sessions from the Fighting Fit team? Get in touch today.